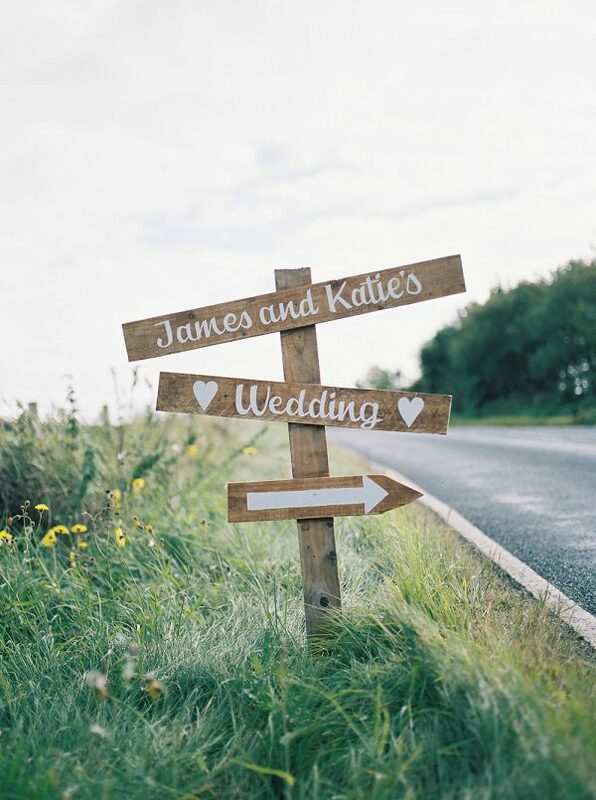 Directional signs not only look lovely, they’re helpful for your wedding guests too. Direct your guests to and around your wedding venue. For instance, use a collection of arrow signs to show your guests to the toilets, bar or dance floor area. Signs with instructions are very useful too. 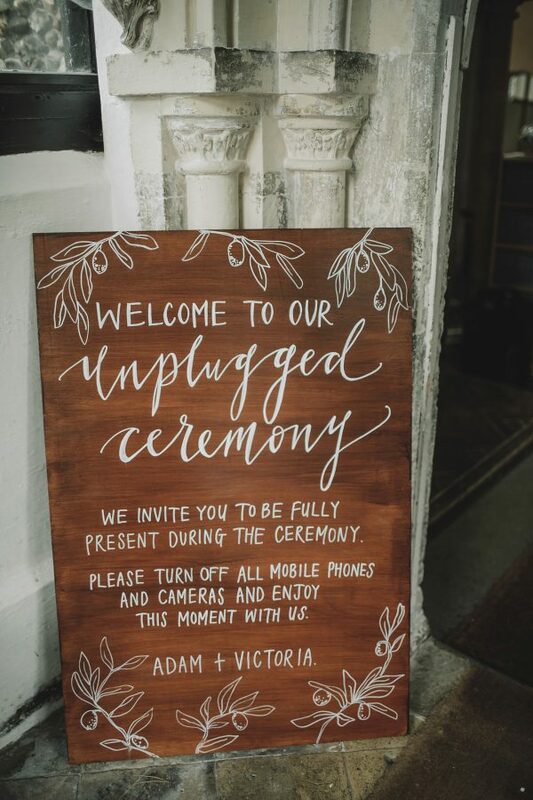 For instance, if you’re planning on having an unplugged ceremony it might be a good idea to write this on a sign at your wedding ceremony so that your guests are aware. 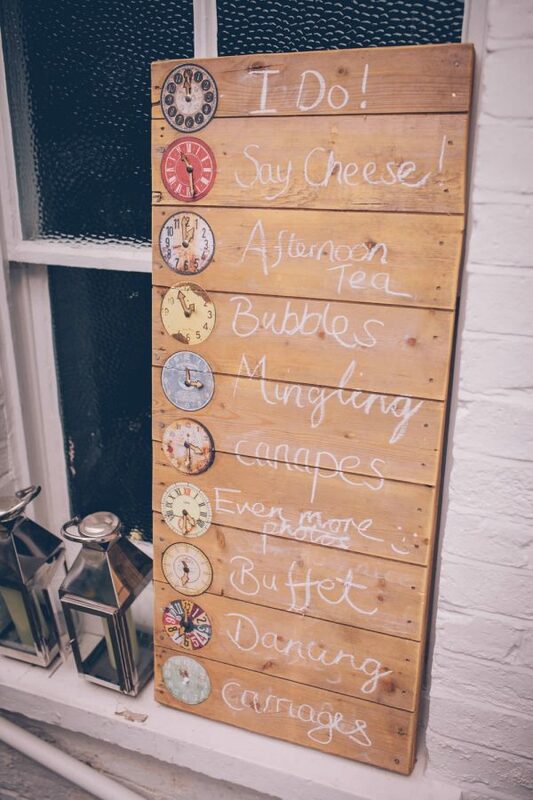 Consider creating a sign to display your wedding day timings. Guests always like to know the timings of a wedding day and it’s a lovely way of reflecting your wedding theme and style. You could even add some bespoke illustrations to demonstrate each timing. We love using welcome signs to decorate the entrance of Pynes House. 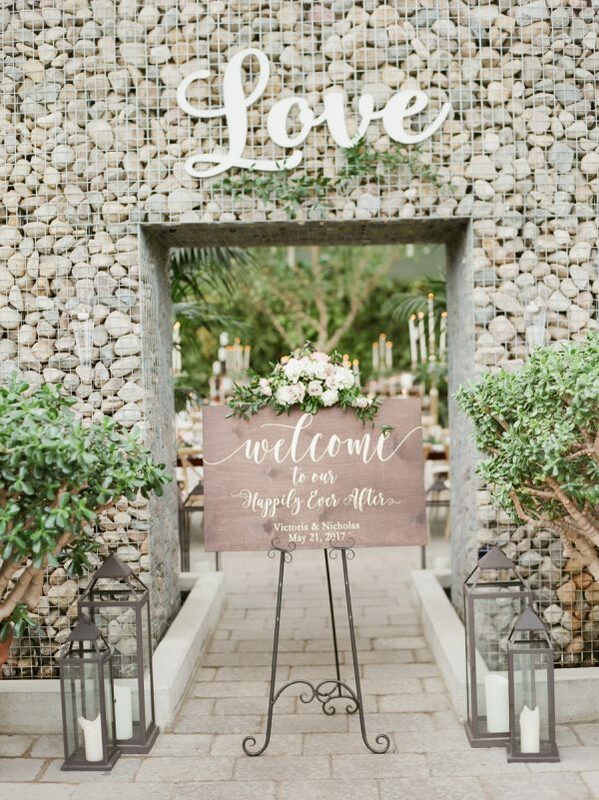 Welcome signs are a fabulous way of setting the scene for the rest of the day and they’ll also help to reassure your wedding guests that they’re in the right place. 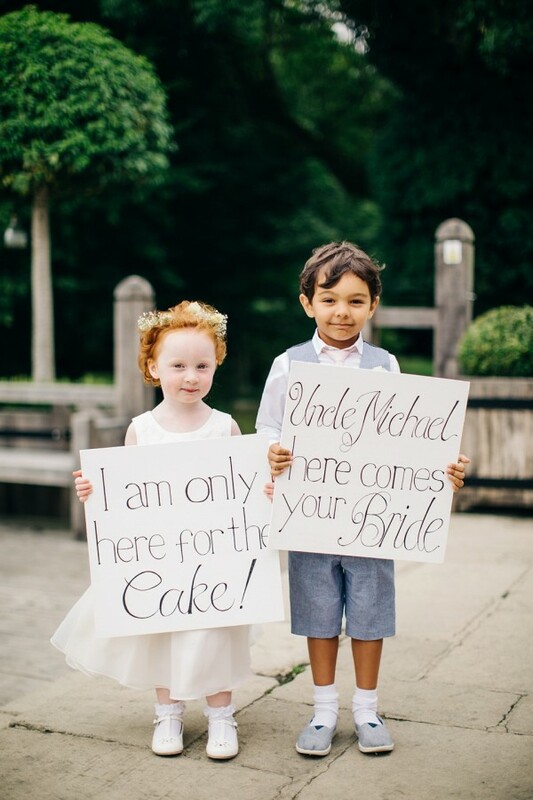 Make your flower girls and page boys even more adorable by asking them to carry cute signs as they walk down the aisle. You can personalise them to make them soppy, fun or traditional. Smaller signs also look gorgeous as chair covers. 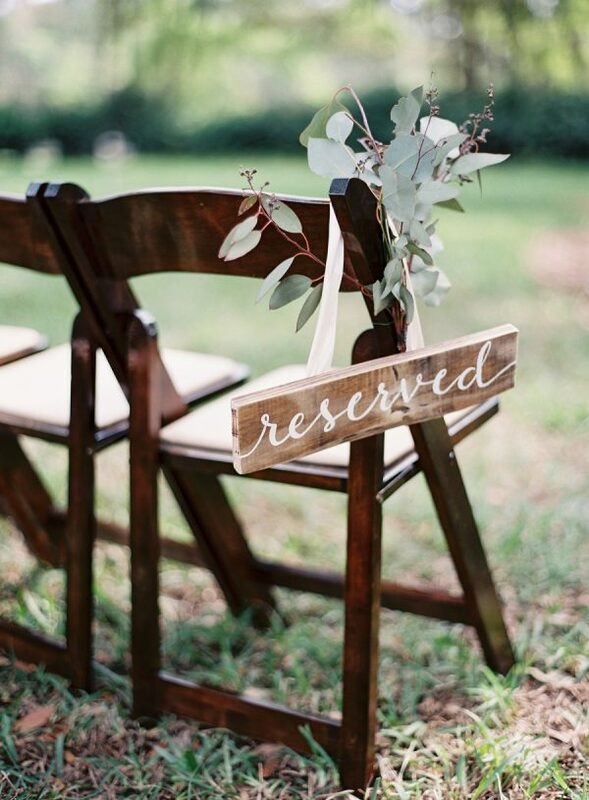 Whether it’s a sign saying ‘Mr & Mrs’ for your wedding chairs or a ‘reserved’ sign for your ceremony seating, they’ll look oh-so-stylish. Show your guests to your wedding confetti by creating a cute confetti sign! You could even create a designated confetti station so that guests can help themselves. Do you and your partner have a shared love for a particular quote? Then write it on a sign! This can be used to decorate your wedding venue and it’ll look gorgeous as part of your home décor after the big day. 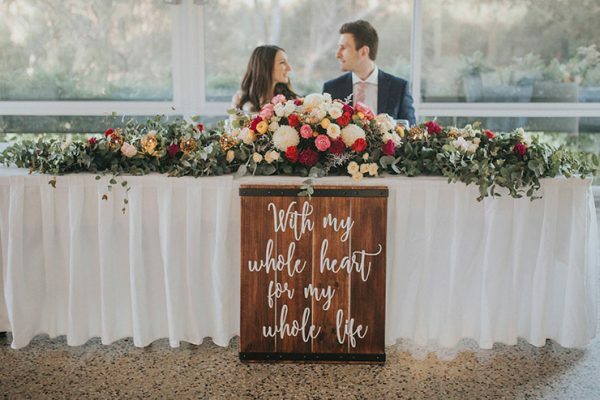 Signs also make gorgeous backdrops for wedding cake tables, sweetheart tables or even for a DIY photo-booth. Wedding hashtags are becoming an increasingly popular way of sharing photographs. 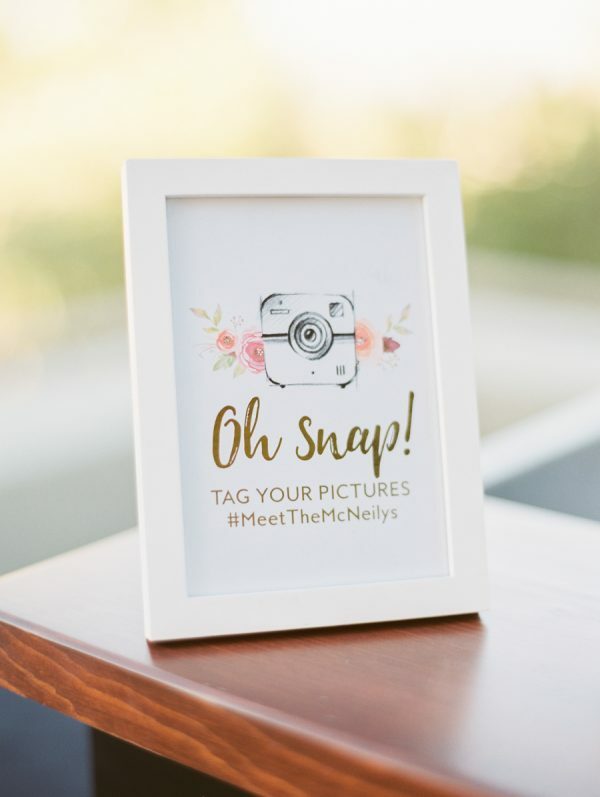 If you have chosen to use a personalised hashtag, we suggest writing it on a small sign so that your wedding guests know to use it when they upload their photos. Show your wedding guests to their seats in style. 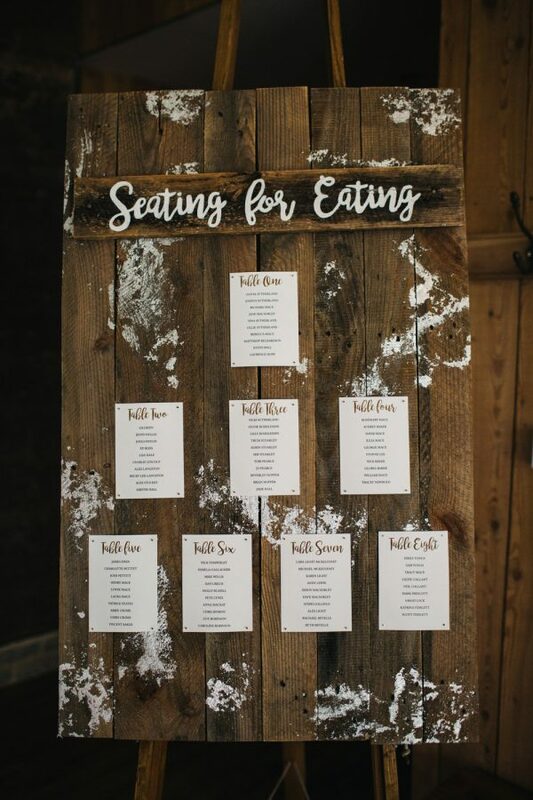 Signs make gorgeous rustic-inspired table plans, and we adore the thought of adorning the seating plan with foliage or seasonal flowers. Looking for ways to get your wedding guests on the dance-floor? 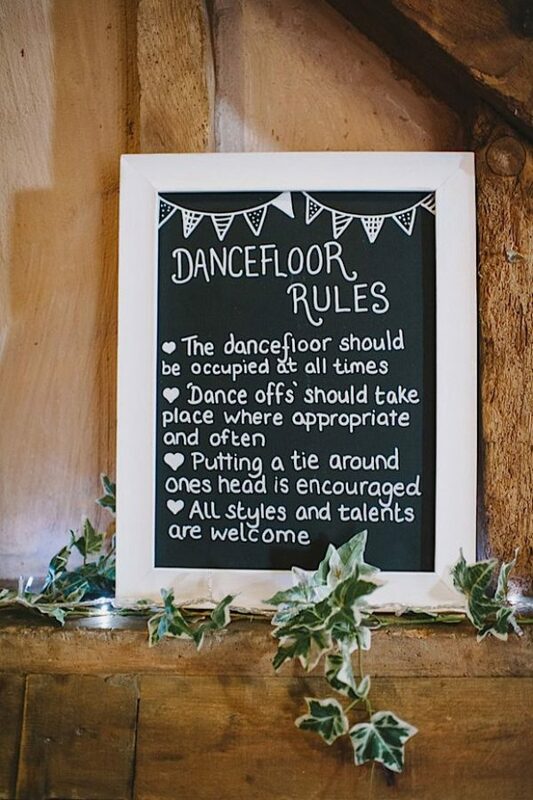 Writing the ultimate dance-floor rules on a sign will be the easiest way of getting your loved ones up and dancing! It’s also guaranteed some giggles. 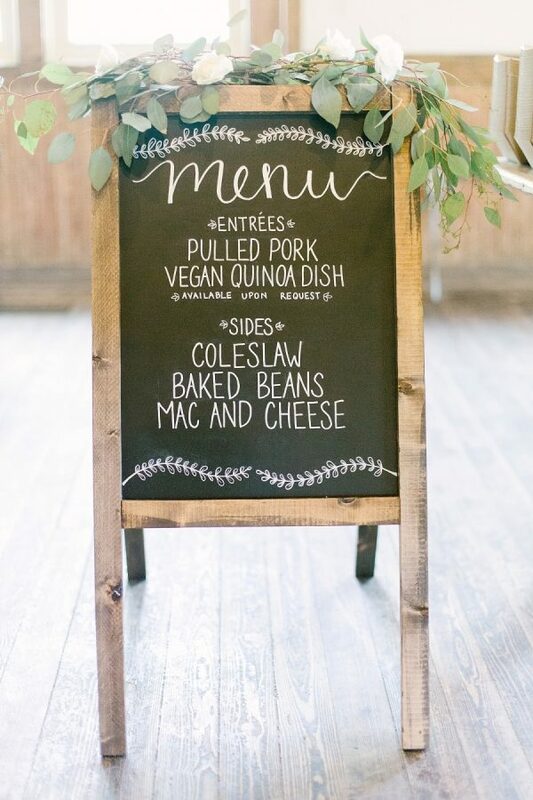 Rather than using lots of small menu cards on your place settings, consider writing your menu on an oversized sign. You can place it in your reception room so that your guests know what is on the menu for the wedding breakfast – yum! We feature some incredibly talented wedding caterers in our little black book of suppliers so be sure to check them out here. Mini cocktail stations are a huge trend in the wedding world at the moment, with couples serving signature cocktails to family and friends. A personalised cocktail station sign will show your guests what is on offer and it’s a chic way of adding a unique touch to your celebrations. 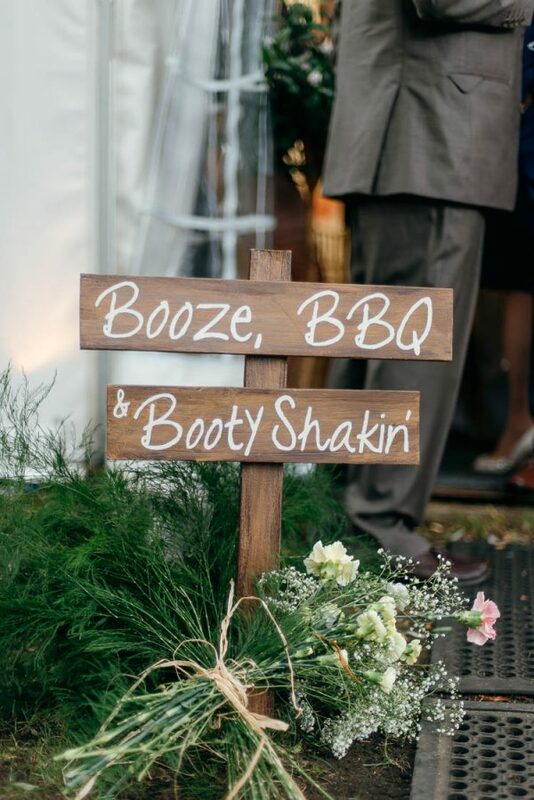 Wedding signs are seriously versatile so you can use them however you want. They can just be a fun and fabulous decoration for your wedding day, whether you use it during the ceremony, reception or the party! 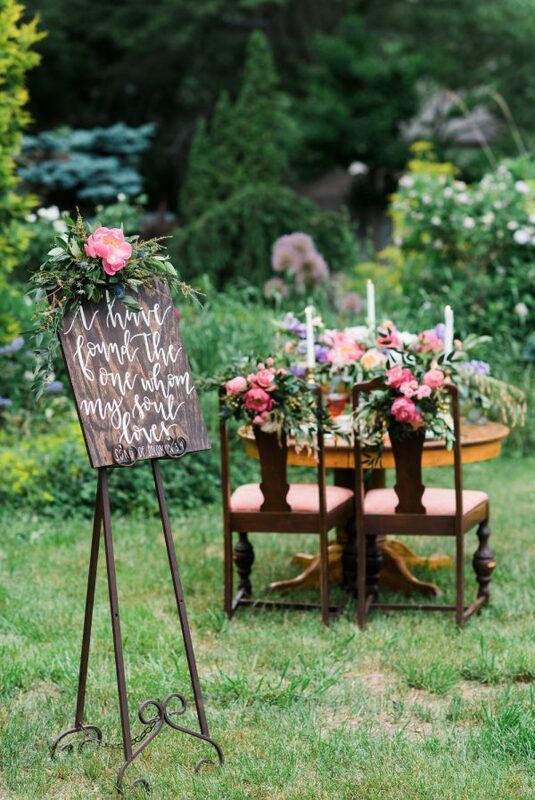 There are of course a couple of things to consider when choosing your wedding signs. Think about your wedding theme, colour scheme and overall style when choosing your signage. 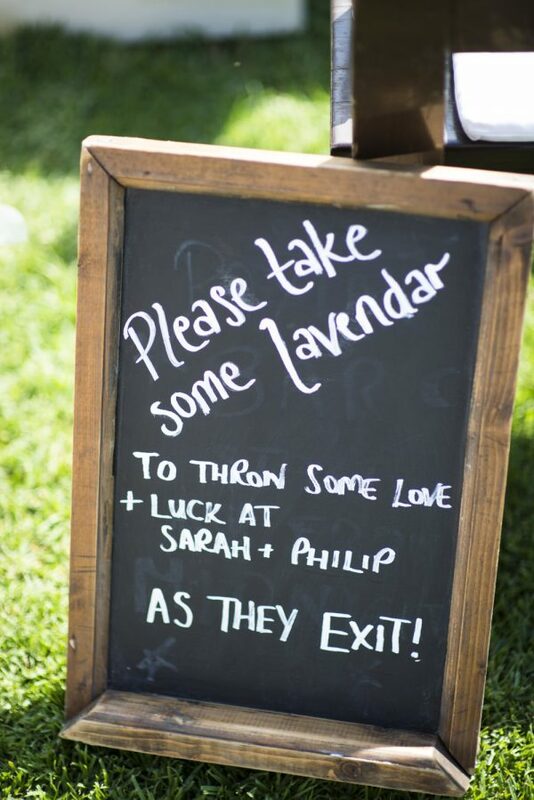 Don’t forget about materials too – do you want wood, chalkboard or metallic signs at your big day? 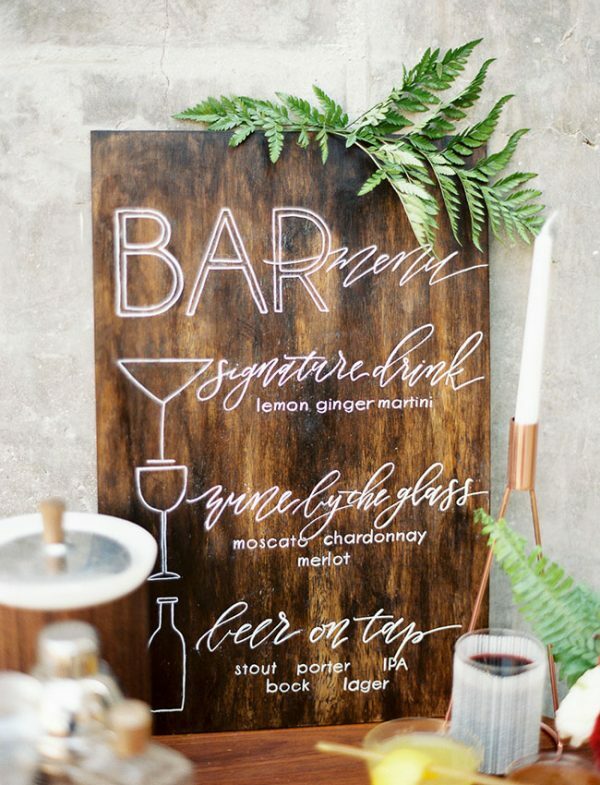 Signs can be a fun DIY project for the crafty bride and groom, but many calligraphers offer a bespoke sign service. 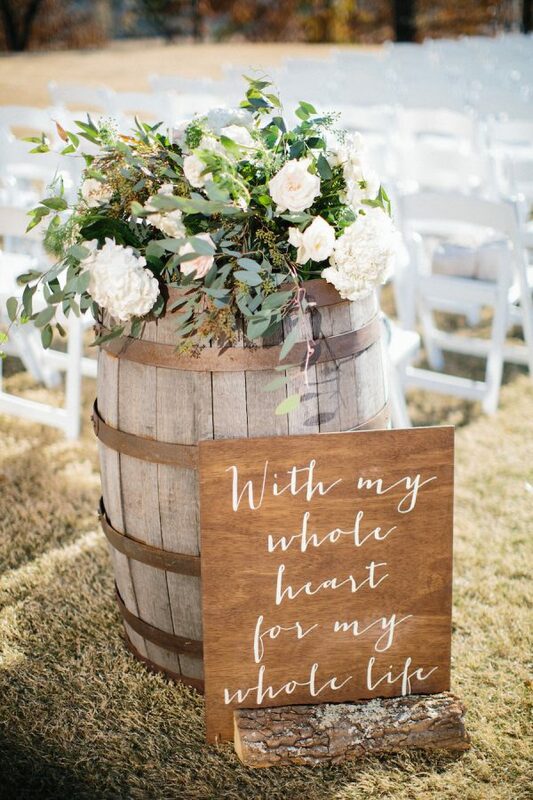 There’s a lot to think about but we can promise you that wedding signs are a fabulous addition to your big day décor.